As mobile devices get better every year, more and more people are choosing to work away from their desks. While laptops, phones and tablets are bigger than ever before the need for larger screens remains. Those willing to splurge on the largest devices then have to deal with the problems of the additional bulk when that larger screen isn’t needed, but there is an alternative. Portable USB monitors are a subset of devices that has been slowly evolving over the years while everyone has been paying attention to other display tech, and ASUS’s ZenScreen MB16AC is a perfect answer to the need for more screen on the go. The main attraction here is the 15.6 inch screen that serves as a full HD, IPS display. If hearing about that size makes you worry about weight, don’t as the MB16AC is much less than a kilogram at 780 grams and just 8 millimetres thick. This is also saying nothing of the ASUS Eye Care features like a blue light filter to make getting to sleep a bit easier after putting in the late hours. While a large screen in a small form factor would be good enough on its own, that doesn’t count for much if you’re still lugging around an unwieldy slate in your bag. That’s not a problem here as the foldable case present here doubles as a stand to prop the monitor up in a variety of ways, no doubt borrowing from similar designs seen on the tablet market. If landscape doesn’t work for your graphs, presentation, code or other content you’d like to display, that’s not a problem thanks to the automatically-detected orientation change in action here. Simply flip the monitor around and your content changes too. In portrait mode this monitor can still stand upright, even without the case. A small hole in the panelling makes room for the included smart pen to double as a stand. With the orientation just right getting it running on most devices is a breeze thanks to the fact that both video and power are handled over a single Type-C USB port. If your laptop, phone or other device doesn’t have the newer Type-C port, that’s not a problem as the regular Type-A is still supported here. 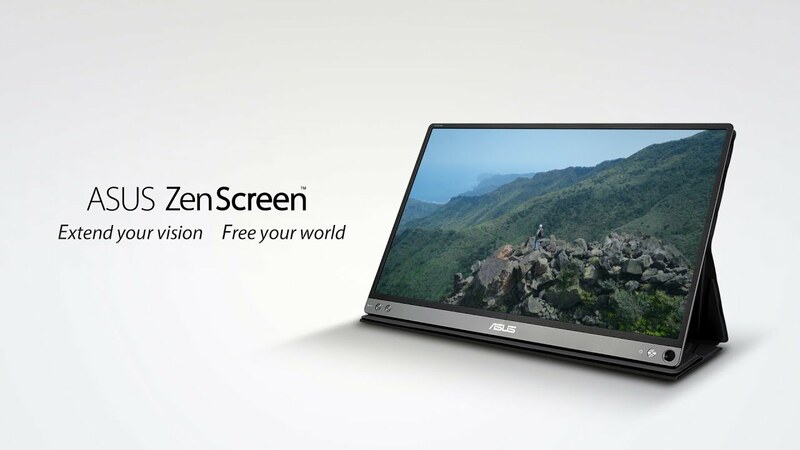 If you’d like to get yourself a ZenScreen MB16AC, ASUS South Africa is offering the product in South Africa. Check out their site to learn more and order your own.